The Big Picture: We asked, and you answered. After poring over more than 100 photo entries, we present the winners. Sinning With the Like: LBW's interview with one of Tori's most talented opening bands, allmusic.com's September 20th spotlight artist. Redheading stories, reviews and all our regular features. PLUS a coupon card for free US shipping on the limited edition signed and numbered Bob Masse print to benefit Katrina victims through RAINN--a $5 value. Little Blue World is a full-size, professionally printed quarterly fanzine dedicated to Tori and Toriphiles. 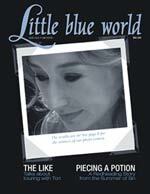 Please visit the Little Blue World website and subscribe online. An annual subscription of 4 issues is $16, and all proceeds from LBW will go to RAINN. (The cost is US $22 for subscriptions to be mailed outside of North America). For Toriphiles in the U.K. you can also find this fanzine in Tower Records in Picadilly Circus in London. I, Mikewhy, have subscribed to this issue from the beginning and I find it to be a high quality publication that is very well done. I recommend you try it! Visit The Little Blue Word Web Site for more details about the fanzine and to find out how you can subscribe. The Tori fanzine Little Blue World is always seeking photos from recent meet'n'greets and shows. Photos may be submitted electronically or by mail (instructions below), and you will receive a complimentary copy of any issue in which your photos appear. Photos must be scanned at 300dpi in .tif or .jpg format. No .gifs. Before sending via email, please compress your file using DropStuff (Mac) or WinZip (Windows) and save as a self-extracting archive (.sea). Send to <artwork@little-blue-world.org>. Please include a self-addressed stamped envelope (SASE) if you would like your disk or hard copy returned to you. More detailed submission information can be found at www.little-blue-world.org.